HMS Safari was one of the most successful British submarines of the Second World War. Between March 1942 and September 1943 she sailed some 31,312 nautical miles and spent 139 days submerged. During this time she fought 58 actions against Axis shipping and sank 34 ships, totalling 85,000 tons. As Safari's Leading Telegraphist, Arthur Dickison had a privileged position in the crew. With access to all signals traffic and the navigation officer as his 'boss', Arthur was afforded a unique insight into daily operations. Throughout eighteen months of war patrols he kept a personal diary (strictly against the rules) of life aboard Safari, recording daily events that ranged from the tedium of long sea passages to stalking enemy convoys; from crash dives to fighting it out with enemy shipping on the surface; from making submerged attacks with torpedoes to 'sitting it out' on the sea bottom while depth charges rained down all around. The full range of the submariner's experience - and of human emotion - is here in this vivid eyewitness account. Arthur Dickison joined HMS Safari on her first commission in March 1942 and remained with her for eighteen months of war patrols in the Mediterranean as the boat's leading telegraphist. He left the Royal Navy in 1949 and now lives in retirement in Devon. While the editorial description of this book sounded interesting, the book itself was an extremely boring disappointment. The bulk of this book deals with what the author ate and when he slept and how much he missed his wife. The actual battle descriptions are rushed through, sometimes in two or three sentences, while the author's personal daily routine goes on and on for pages. It is interesting to note that although the HMS Safari is touted as one of England's most deadly subs, the majority of it's sinkings were of small craft and schooners by gun action. Even enemy ships which ran themselves aground to escape being torpedoed are counted by the Brits as tonnage sunk! Overall, I couldn't wait for this book to end. BORING! I have read a number of books on submarines and submarine action. This book I found very moving, the author was a very young man when the experiances within the book occured. One can sense his very real fears and hopes within his words. The events within the book were recorded in real time as they were unfolding. 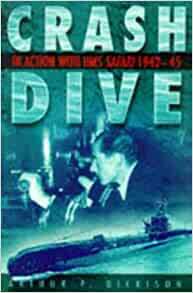 The life on board a submarine in wartime was not all action and gunfighting. This is effectively conveyed through out the book. To summerize; a very real, true to life depiction of life on and off board a British sub at war. My father was a submariner on this boat and received the DSM for service in action. Obviously this means the book is of personal interest to me however it is a great insight into life on a sub during WW2. Day to day life was tedious and monotonous they weren't always fighting. However this diary provides the reader with a ratings view of the war. Something that was technically not allowed. As a personal perspective it is a worthy historical document.